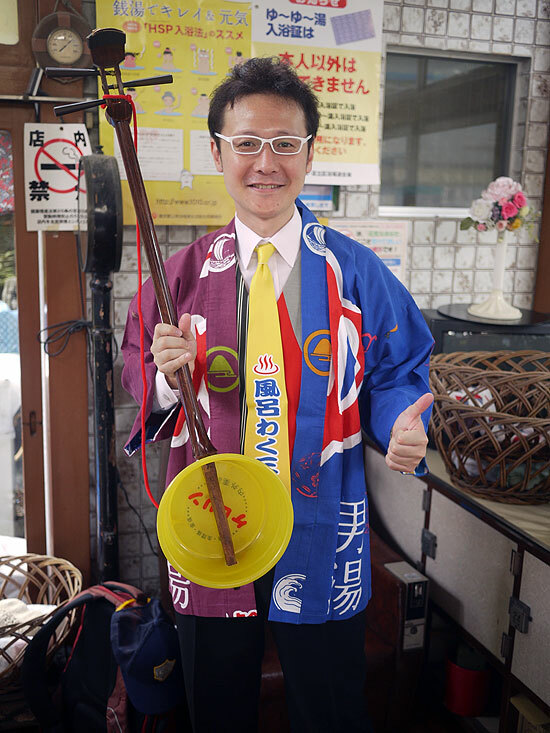 Today’s interview is with an extremely talented amateur rakugoka whom I first met while performing together at the Chiba International Rakugo Tournament. I thought his perspective as a foreigner interacting at a level with Japanese comedy, specifically rakugo, would be interesting and enlightening. I hope you enjoy this interview as much as I did. Editorial comments are in parenthesis. Shawn: Please tell me about yourself. LoveMehta: My name is Nirav Mehta and I’m also known as Kadentei LoveMehta. I first came to Japan a little bit by chance. When I was in college in the US I randomly took a Japanese class and really enjoyed it. At the time I was a physics major but I decided I didn't want to do that anymore and I decided to become an East Asian Studies major instead. So I came to Japan for the very first time in college. I studied Japanese all throughout college and you know, after I graduated I had Japanese ability so I was a JET (Japan Exchange Teaching program) for a year and change and went back to the US and I had Japanese ability and not much else. So I went to law school and worked in New York for a few years, which was educational if not all that much fun. I won’t say much more about that. But then I soon got fed up with it decided I wanted to come back to Japan and thankfully there was a job here. That was three years ago and I’ve never looked back. S: And the visa people haven’t tracked you down yet? L: Not quite yet. I’m up for renewal in the fall but I’m probably just going to switch to a spouse visa because I got married this year. S: (Clap clap clap) Yah! I didn’t know! L: Thank you very much. I got married this year so I will probably switch to a spouse visa after we take some photos to prove that we are actually married because apparently that’s what you have to do. S: That is a funny thing that you have to do. I had to do that too and your spouse has to write an essay on how you met and everything and things like that. L: Yes, she is not looking forward to it and she asked me to review it. S: Did you discover rakugo in the United States or Japan? L: So I first found out about rakugo when I was at college. As part of my final year of Japanese at college we did a unit on Japanese theater and stage performances and I went to Columbia which is very closely connected to the world of Noh, which as you know is extremely boring and not particularly fun. So the focus was mostly on Noh and related things. And kabuki which is more fun but still not acceptable. S: Yes, I’ve heard Noh is short for “Noh thank you”. L: Yes, and also things like the puppet theater but at the very end we did a short unit on rakugo. I wouldn’t even call it a unit. It was about five minutes of watching rakugo on a tape but I thought it was excellent. I can’t remember for the life of me who we were watching. I have a sneaking suspicion that Katsura Shijaku but I don’t remember. S: Was it in Japanese? S: There isn’t a lot of anything in Saga. L: No, there isn’t a lot of anything in Saga. There’s pretty much nothing. It’s a wonderful place. It’s a great place to live. I’d love to retire there but…I’d love to retire there. There probably isn’t any more to say. S: So you are saying it’s a great place to die. S: Don’t worry. I don’t think the Saga Tourism Bureau is looking at my website. L: Ha ha. But while I was in Saga from time to time and came to Tokyo for various reasons and when I, one of the trips I took I decided I wanted to go watch rakugo live and so I took a trip to the Asakusa Engei Hall, which was my first true exposure to rakugo. S: A good place to start. L: I will admit that I was a little but disappointed because the day that I went happened to be one of the days when I am pretty sure it was Koyūza’s New Oirans musical performance which meant that the tori (headliner) was not doing rakugo. So I was a little disappointed but all in all I really enjoyed it. After that every time I came to Tokyo I made a trip to Asakusa specifically to watch rakugo. And I kept kind of doing it and one day when I was living in New York and it turned out that I was going to move to Japan I said to myself, “Well, when I move to Japan I would like to do something very Japanese and hey, I wonder if there is a rakugo class somewhere that I can go to.” And that was three years ago and I haven’t looked back since. S: I don’t know why you didn’t go to Noh but whatever. L: I get enough sleep as it is. Ha ha. S: What about rakugo attracted you to it? L: Well, you know part of it was, to be honest, the challenge of learning enough Japanese to be able to understand it. I really enjoy the Japanese language. That was sort of my entry point. I really enjoy the word play, the communication ability that you have to have to not only be funny but to tell a story. S: Yes, and the Japanese in rakugo is not your standard Japanese. It uses lots of unusual language and older things are referenced. L: Yes, and I found that to be really, really interesting. People always ask me if I make up my own stuff. I will admit that I have tried to. I am trying. L: No, I didn’t write “Toki Soba”, surprisingly. Yeah, but that aspect of it is really, really interesting. And then the other thing that I sort of seen afterwards was being part of the (rakugo) community. The people who are not a, I probably know more about rakugo than most foreigners do but if you judge me on the scale of the Japanese rakugo fanatics I’m so (gestures to a low point). S: 100 and I was just going to ask you, I’m so hip with the Pokémon references. I know the kids are into these days. S: I was just going to ask about the rakugo community. What do you think about them? L: I think it’s great. S: Well, especially the amateur level of rakugo. L: The amateur rakugo community…well, taking it first in two steps, the people who are just fans, which is not an inappropriate way to put it, are generally really interesting people, kind of happy-go-lucky types. Also they know a lot about this one particular art form. I consider it to be the most refined example, the most developed example of the Japanese concept of shumi, which is usually used to mean “hobby” but that’s actually not well translated into English. It goes way, way, way beyond that. If you have something you are calling your shumi in Japanese you spend all of your free time on it. There’s all these sort of people. I tend to enjoy listening to people who are very passionate about something. As you know, especially with older and middle aged Japanese men, when they have a few drinks they can talk about one topic forever and ever and ever and ever. L: I know! You seem like you were surprised to hear that. (I’m not) But actually doing that I find that very fun. The fan community is great but the other amateur rakugoka, I haven’t really found a good translation for that, some people use the word player but I don’t like that. L: The other amateurs are amazing. They are so much fun and it’s such a nice community. There are these competitions. Well, there aren’t that many of them. The competitions are there to have fun. I don’t think anyone is going to win a competition and turn pro or anything like that. L: I think that takes a bunch of the pressure off. There isn’t a lot of competitiveness at the competition. Of course people like to win but I have always felt very welcome. People are willing to teach you and give you their honest opinions on stuff and I’ve made a lot of friends through rakugo and the community has been a great thing for me. S: Plus, it’s kind of hard to judge humorous stories in a competition. L: Yes. I suspect that there will be a number of people who will tell you that it’s not fair when I do rakugo because I’m funny to look at to begin with. You don’t have to make a comment about that. That’s fine. L: Ha ha! That’s true. That’s just one example how everyone’s rakugo is different. S: You use the tools that you are given. S: Thank you Mr. Rumsfeld. L: Ha ha ha ha! But I don’t think I’ve ever experienced a community that is gathered around one topic in the same way. S: I kind of almost think of them as “professional amateurs”. L: That’s probably a very accurate description. S: It’s weird to put those two together but…they may not get any money out of it but a lot of them travel around and they perform in different places every month. L: I knew of somebody who performs almost every two weeks, if not every weekend. S: No wonder he’s good! L: Right? And these people are just amazing. S: I don’t know why I’m not better performing once a year. L: Ha ha ha! I don’t know why nobody wants you to perform. I kid! But for these people it's a huge part of their identity. They are amateurs but amateurs in sort of the literal use of the word. They really get involved in the art and the world itself. S: So somebody gave you your name? L: Yes. So my name is Nirav Mehta, which if you turn that into katakana it becomes nirabu me-ta- and if you just take the “ni” off it turns to rabu (which sounds like the katakana version of the word “love” in Japanese) me-ta- and that is the genesis of that name. L: It was not my first choice. S: Did you have a choice? L: My original choice was “kebab”. L: Because although I’m not Turkish Japanese people don’t know the difference. S: Ha ha ha. You could use that in the beginning of your routine. L: Also I’m a big fan of yakitori and I figured that yakitori and kebab are both squired meat. And that was all fine. I was going to do kebab in hiragana and I think that would have been fine. Except I have a little bit of a complex from living in Japan about being hairy so I wanted to make the “ke” of kebab into the character for hair (the word for hair in Japanese is “ke”). L: Yeah and the Shishō of Kadentei was like, “Kimochiwarui kara kyakka” (“Because that’s disgusting permission denied”). S: You don’t hear a Shishō say, “That’s gross. I don’t want to do that.” very often! Ha ha! L: Ha ha. So he said what’s your really name? Let’s do something based off of that. And so that’s the origin of LoveMehta. S: Thank you. I’ll be here all week. Actually I like Kebab that would have been cute. L: I could make so much more money doing rakugo. Ha ha ha! S: Kebab! Kebab! Kebab! You’ll be the guy in Shinjuku or Ueno’s Ameyoko going, “Hey! Hey! Handsome girl! Kebab?” (Bad Turkish impression). S: They thought you were one of them? L: They also thought I was Turkish and for a while they thought I was natural customer. S: What is your ethnic background? L: But nobody here knows the difference. Ha ha. S: Well with you complexion I can completely understand that mistake. S: Are there any specific professionals that you like? S: We can be thankful for that when we are transcribing things. L: Exactly. Especially when compared to Kosan the 5th. I also don’t really know how to say that in English. I guess that’s the right way. Godaime Kosan (Some rakugo masters inherit a name of a master who has passed on, hence the addition of “the 5th”) who is also a wonderful rakugo performer but if I told you I understood everything he was saying I would be completely lying. It would be a ridiculous lie. Among the people that are performing today, I haven’t laughed at “Toki Soba” more than the time I saw Shōta do it at Asakusa. That was amazing. His version of “Toki Soba” is excellent. I’m also a big fan of Koyūza Shishō. The teacher that I am currently working with is one of Koyūza’s apprentices. He’s a Shin’uchi (the top rank of a rakugoka) in his own right, named Sanyūtei Yūba and his style and mine tend to overlap a little bit as he sort of plays of the sort of drunk, silly, stupid or otherwise laughable characters. And I really enjoy that. S: There are a lot of those characters in rakugo. S: What have you found difficult about performing rakugo? Besides the language aspect is there anything else? L: Ha ha. Well, I mean the most difficult thing is sitting in seiza for 15 minutes! (seiza is a style of sitting where you fold your legs and rest your bodyweight on your lower legs) Ha ha ha. S: You don’t have to tell a 6’ 6” person that! L: I sometimes wonder if seiza is the reason that Japanese don’t grow taller than they do. But the seiza is difficult. But as I was saying before, the ability to really communicate something in a way that’s concise and piffy and funny and yet still is understandable for somebody who doesn’t know the story is really difficult. All of these stories, especially when you spend a lot of time with people who are really connoisseur they know what’s going to happen. They’re very, very well versed in the story. Nobody needs to tell them what’s going to happen. But I think rakugo is most fun when you perform it in front of somebody you doesn’t necessarily know what’s going to happen. Somebody who hears “Toki Soba” for the first time is going to have a different reaction to it than somebody who has heard it for the twentieth time. And it’s partially a language issue on my part and it’s partially it's a cultural issue, it’s a communication issue. I find that to be very difficult. But I also find that to be the most rewarding part, when you reach a level with the story where you feel comfortable performing it in front of people who don’t necessarily know what’s going on. That’s great and more than I realized, I think it has a lot to do with your, I won’t call it acting ability, I’m not an actor, I wasn’t in theater when I was young. It’s really your expressive ability and your ability to communicate, which, I don’t know, maybe an actor would use the same thing. But that is something that has been challenging and rewarding to work on. S: Do you have any future goals? L: Well, I’ve talked before about not being overly competitive but I would like to, it’s not so much the competition part but some of these competitions are structured with a preliminary and final round and I’m going to expose myself as a little bit of a ham here. I really enjoy performing at the final round, in front of very large gatherings. 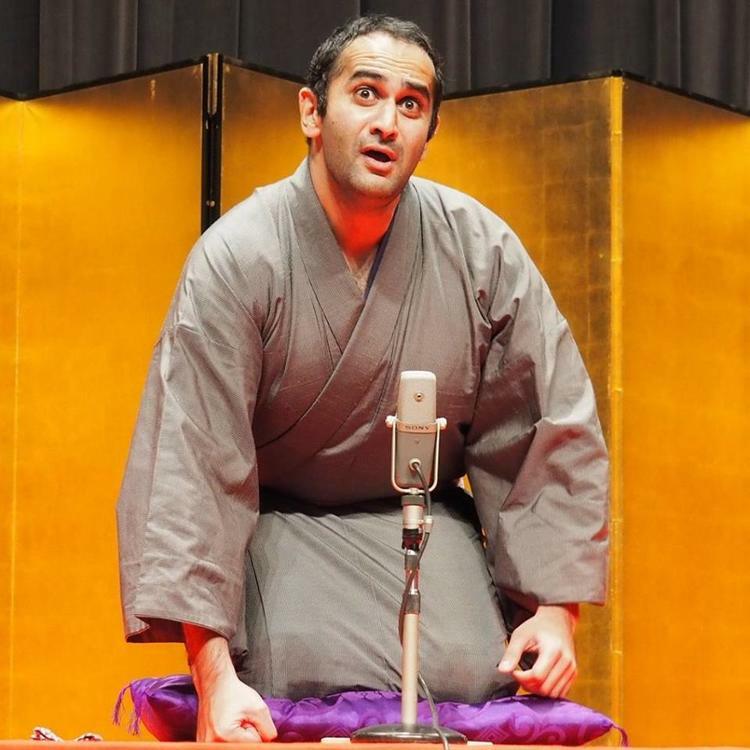 I’m not so self-satisfied that I think I’m going to beat someone who has been doing rakugo for 25 years in their native language but the opportunity and ability to perform in front of a large group of people is extremely exciting and also extremely humbling and I really enjoy that. I’d like to be able to keep doing that. 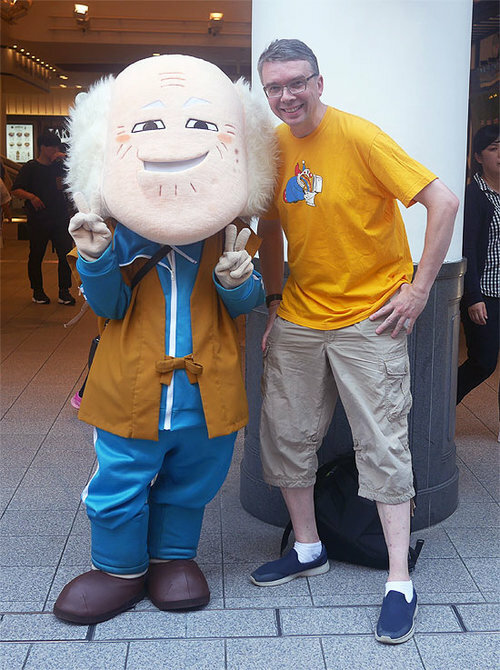 I’m not a hundred percent sure how much longer I will be in Japan so I’d like to take advantage of as many of those opportunities as possible. S: Have you performed in English before? L: I did a very short string of kobanashi (very short stories that are often told at the beginning of a performance), short jokes in English. It is shocking how much easier it is to memorize something in your native language. S: Tell me about it! When we have an English rakugo performance, I’ll be there and do three stories. Not just one. L: Ha ha ha. I haven’t found… could probably just do it on my own…but I haven’t found a lot of translated versions of rakugo that I think are funny when told by a native English speaker. There are some things that I think work when told by a Japanese speaker, speaking in English. I don’t know. Putting a lot of, as a non-native Japanese speaker, dropping a lot of Japanese into your English rakugo is …I don’t know. Maybe if you’re very good at it it’ll work but I think it could be off-putting. I haven’t found great version of English stories to tell but that’s something I’d like to do. That’s the other amazing thing. There are people who, in Japan, perform only in English, who are Japanese! And there are huge communities of these people. Huge is probably not the right word but there are communities of these people. But there are these communities and they all tend to be very interesting people and I’d like to get into that. S: Well, if they are boring rakugo people they probably aren’t that funny. S: Would you consider performing in the United States? L: I would. Um, I’m a little bit hesitant is what I was saying before. I haven’t really found an English version of rakugo that I think is really great for an English audience. S: Well, I do know some performers that go abroad and of course there are some that perform in English but there are also some who perform in Japanese with subtitles on a screen behind them. L: Yeah, I haven’t seen that. A friend of mine arranges these kinds of performances and he has invited me but they tend to be on Tuesdays, which is not going to work for me. That seems like it could be very, very fun. S: I’m sure Columbia would welcome you back and love to have you perform. L: Maybe one of these days I may get in touch with my old Japanese teacher and have her invite me. S: I know several that go back to universities like Middlebury and perform and teach courses and such. And do you have any performances upcoming that you want to plug? L: There is one in October and actually on the topic of English rakugo, on October 22nd I am performing with a group of amateur rakugoka in what we are calling the “Pan-America Rakugo Exchange Program” or the “Nichibei Kōryū Kai” where it’s me and five Japanese performers and I’m going to be performing in Japanese and they will all be performing in English. We did this once last year, which is where I did my little bit of kobanashi in English and I though it worked out pretty well. They are these sort of really, really seasoned veteran types. It will be a great time. (Information on place, date and time to be posted soon) But that’s the next one. S: Well, thank you so much for letting me interview you today. It was a lot of fun. L: Thank you, it was my pleasure.